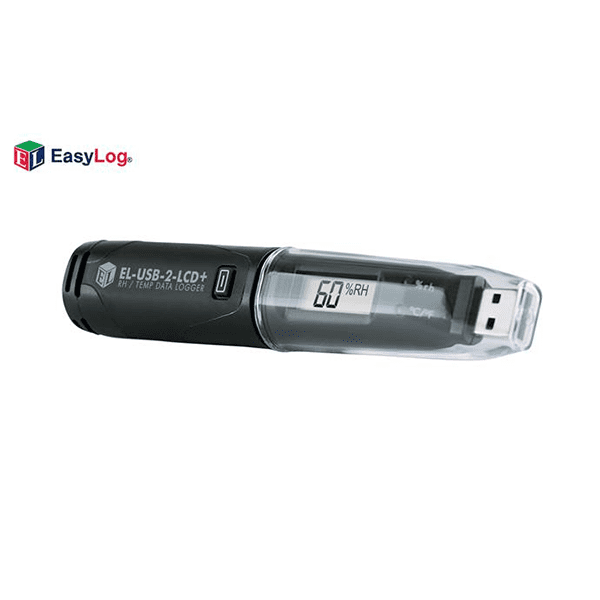 TheLascar EL-USB-2-LCD-Plus USB Temperature Humidity Data Logger is a stand alone data logger that measures and stores up to 16,379 relative humidity and 16,379 temperature readings over 0 to 100%RH and -35 to +80°C (-31 to +176°F) measurement ranges. The user can easily set up the logger and view downloaded data by plugging the data logger into a PC’s USB port (not compatible with Mac unless used with the EL-DataPad) and using the supplied software. Relative humidity, temperature and dew point (the temperature at which water vapor present in the air begins to condense) data can then be graphed, printed and exported to other applications. The high contrast LCD can show a variety of temperature and humidity information. At the touch of a button, the user can cycle between the current temperature and humidity, along with the maximum and minimum stored values for temperature and humidity. The data logger is supplied complete with a long-life lithium battery, which can typically allow logging for up to 1 year. The data logger is protected against moisture to IP67 when the protective cap is correctly fitted. * This specifies the overall error in the logged readings, for relative humidity measurements between 20 and 80%RH. ** This specified the overall error in the calculated dew point, for relative humidity measurements between 40 and 100%RH at 25°C. *** Depending on sample rate, ambient temperature and use of alarms LEDs. The core of Lascar’s data logging solution is the free software supplied with each data logger. Using a wizard format to guide the user through setup of the data logger and subsequent download of collected data, the software puts the ‘easy’ into EasyLog. Compatible with 32-bit and 64-bit versions of Windows 7, 8 and 10. (not compatible with Mac or Linux).